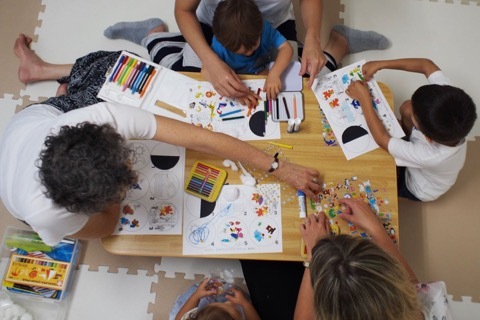 On Sun Sep 10 Ann launched TMC’s twice a month children’s Sunday school in Japanese. Although multiple languages are spoken at TMC, the children predominantly speak Japanese. Ann had three little ones on Sep 10 and two others were sick. She has hoped to start this for some time and loves the ministry opportunity it provides. And she really appreciates the help she is getting from one of the moms. TMC’s worship service is in English so we have been planning ways to incorporate other languages in our regular Sunday events. Ann’s children’s Sunday school in Japanese is one such non-English event, along with our weekly adult Japanese Bible study taught by Duane. This month we are also planning to begin a monthly Sunday afternoon Chinese language fellowship, led by Kevin. And we are moving toward launching a Japanese language worship service on Sundays, perhaps initially with a few months of Japanese translation during our current English worship service.